You may receive updates from Massachusetts Education Justice Alliance, the sponsor of this petition. Paul Sagan, Governor Charlie Baker’s appointed chair of the Board of Elementary and Secondary Education, was among the donors whose contributions were hidden. Reports that Sagan had contributed $100,000 to the Yes on 2 effort were dismissed by Governor Baker as a “nothingburger.” Yet the new OCPF disclosures reveal that days before this so-called nothingburger donation was made, Sagan had already contributed $500,000 to FESA, which kept the donations secret. At the time the $100,000 donation was being dismissed as trivial, an opportunity was missed to come clean about Sagan’s additional half-million-dollar donation. 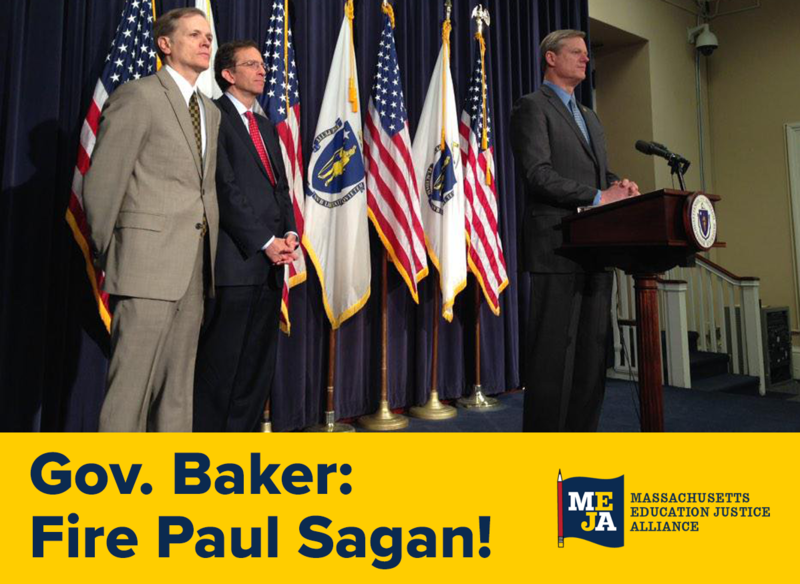 We, the undersigned, call on Governor Baker to immediately dismiss Paul Sagan from his role as chair of the Board of Elementary and Secondary Education. Sagan’s donations were hidden from the public and his money was used to influence public opinion on a major education policy issue. This raises serious questions about his judgment and his capacity to respect his role as a public official. His actions also reveal that he favors private charter school interests over the interests of the more than 900,000 students who attend district public schools in Massachusetts.